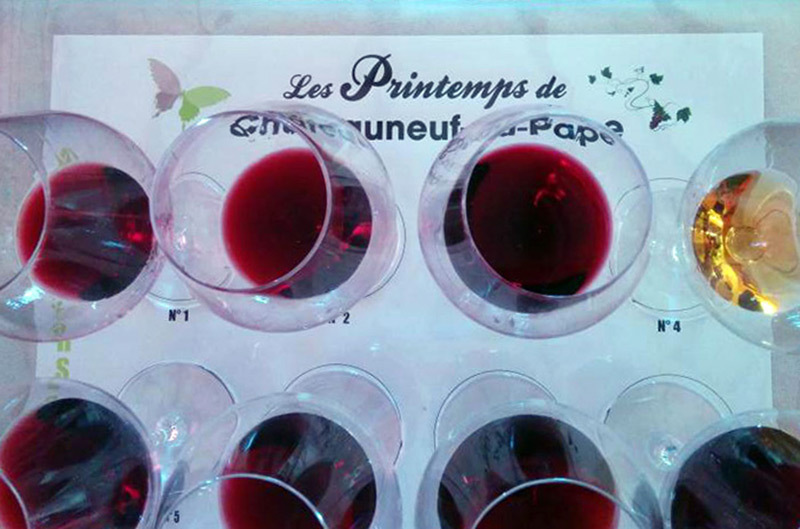 This past 11-13th of April was the sixth edition of Les Printemps de Châteauneuf-du-Pape. Organized by the association of young winegrowers, this year it showcased 86 of the local domaines. The atmosphere is overall quite casual and open to the public the first two days with a professional day closing the event and making for an incredibly pleasant way to sample this Grenache-centric region of the Rhône. For the day of the professional tasting, they had a long table with all the reds and whites of the just-released 2013 vintage to taste as casually as you liked. As noted by others, it’s definitely a lighter vintage. In talking with some of the winemakers it seems that in addition to the climatic reasons, they also added less stems (20% in 2013 vs 50% in more typical years). Personally, the 2012 wines really spoke to me during these days, with their larger, fruitier bodies that were full on the palate although this is probably not a surprise to hear from one who regularly drinks north eastern Spanish wines. I ended up at this event not because of its “short” 3 1/2 hour drive but by way of last fall when paying a visit to Châteauneuf. During a tour and tasting with Laëtitia Barrot of Domaine Barroche she told me that each year they invite a guest region to Les Printemps and for 2015 they were intending to feature Spain which actually ended up being Catalonia thus enabling a heavier focus on Grenache. For anyone who has communicated with French wineries, while it’s an obvious generalization, they are quite responsive when it comes to email. Spain is nearly the exact opposite and early on the organizers were having trouble getting any kind of response from the wineries they had contacted. Due to knowing many cellars in Catalonia personally, the organizers asked if I could follow up on the ground. I happily did and the responses were rather surprising. It was either the case that they had viewed the email as some form of event spam or they were convinced it wouldn’t be worthwhile due to France holding no market value for them. Spanish winemakers tend to view email as existing merely to communicate with importers in different time zones but is otherwise as much a nuisance as quarterly tax filings, so this first response wasn’t surprising. The second reason for not wanting to attend was a bit more of a shock however for if I was a winemaker in Catalonia, a region bordering France, I would jump at an invitation to an event in an internationally celebrated AOC such as Châteauneuf. For me, it and Gigondas are the French binaries to Priorat and Montsant and to see how they work in the vineyards, cellars, and selling of their wines would be a great opportunity for cultural wine exchange. The seven wineries that made the trip included: Lagravera in DO Costers del Segre, Celler de Capçanes and Vinyes Domènech in DO Montsant, Bodegas Mas Alta and Merum Priorati in DOQ Priorat and La Vinyeta in DO Empordà, as well as Epicure Wines presenting their DO Terra Alta wine. They were hosted by various domaines in Châteauneuf and were given free stands to pour their wines during the fair. They were also the focus of a tasting workshop called, “Return to the origins of Grenache” showing their wines in contrast to those of Châteauneuf from Domaine Cristia, Domaine de Barville, Château Simian, Vignobles Mayard, and Domaine Eddie Feraud. They were also free to taste any of the wines at the fair as well as visit the local domains. Lastly, they were inducted in to the local wine brotherhood, Echansonnerie des Papes. An acidic question such as this was to be expected as several Catalan winemakers told me that it had been difficult to get attendees of the fair to taste their wines. One winemaker explained that the French were apparently turned off by seeing such low prices which seemed to throw up immediate flags of plonk. He “adjusted” his prices appropriately later in the day and was met with more interest. Overall this was an exchange with great potential as Catalonia and Languedoc-Roussillon/Southern Rhône share many commonalities such as their push to have Grenache be seen as a more respected grape and not just a rustic part of a blend that you try to smother as much as possible. While I still encounter many top sommeliers who think contrary, Grenache is as revered a grape in Châteauneuf as it is in Priorat. But more than Grenache, these regions also share similar climates, history, and language with Catalan and Occitan being siblings to one another. The takeaway from these three days however was that if Catalan winemakers see little point in going to such a closely-related region and the wine drinkers of that region see little merit in drinking wines from a bit further south with very similar grape blends and climate, then more of these exchanges are most definitely needed.